The home for PlayFab's Unity Editor plugin. This plugin houses a custom inspector for viewing and configuring the PlayFab SDK. 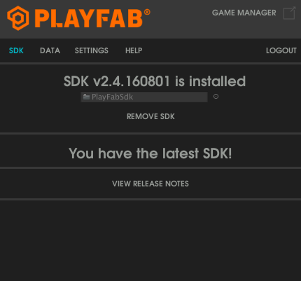 Welcome to the home of PlayFab’s official Unity plugin, the best interface for viewing and configuring our Unity SDK. Our plugin (currently in beta) houses a new custom inspector serving as the remodeled “front door” for our Unity Developers. We will be adding to this platform as PlayFab’s features grow. Automated SDK installation, upgrading & removal - Now pain free! Configure WebRequest settings - Similar to before, except now with an easy to use interface. View, Edit & Save TitleData - Edit your title data keys and values with a simple text editor within the inspector. Download this Asset Package and import into a new or existing project. 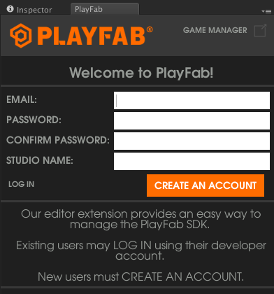 Log in using an existing PlayFab developer account (or create a new account) to continue. Editor Extensions will automatically detect if you have a PlayFab SDK installed. * If you are using a Push Plugin released by PlayFab, please delete it, and convert to FCM. See our [Blog Post](https://blog.playfab.com/blog/push-sep-17) for more details. * If no SDK was detected, this plugin can download and install the latest SDK version from gitHub. After a supported SDK is installed, you will need to select a studio and title id. * you may move the PlayFabSdk to a non Asset root folder, but you will have to let the editor extensions know where you have moved the sdk. After a studio and title ID are selected, you can call APIs and use the Editor Extensions to configure the SDK settings from within the IDE. PlayFab Editor Extensions is a stand-alone Unity plug-in that streamlines getting started with PlayFab. All of the Editor Extensions code lives in editor folders within your Unity Project. This prevents any of the editor code from being compiled into the game build. When a supported SDK is installed, additional service menus are available. These menus provide access to SDK configurations. These configuration settings are saved in a combination of places to ensure that the data persists throughout Unity compilations and deployments. Now that Admin & Server APIs and Models are all included in one single SDK, we require #IFDEF’s to selectively ignore sets that are not needed. In doing so, we also include and omit the DeveloperSecretKey to match the selected settings. As always, never publish your developer secret key in any client facing code. Saves configuration data to the SDK via reflection on the installed assemblies. Setting the STUDIO to OVERRIDE will blank the TITLE ID and DEVELOPER SECRET KEY for manual input. Use this option when you need to connect to a studio to which you do not belong. 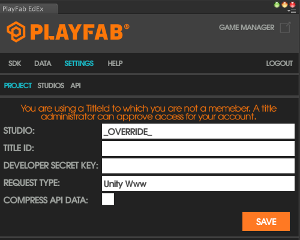 Generally speaking, it is a good practice to only connect to titles to which you are a member; however, this mode can be useful when getting familiar with PlayFab. This project is designed to work with Unity 5.4+. Using this plugin on earlier versions should work; however, If you choose to remove Editor Extensions make sure to close the Inspector window prior to deleting the files. Did you find an issue or is Editor Extensions giving you a bad experience? See GitHub Releases for the latest stable build and patch notes. Editor Extension details can be found under the HELP tab. Here you will find useful links for learning more about PlayFab, troubleshooting as well as EdEx UPGRADE and UNINSTALL options. Editor Extensions is our attempt to make a first class PlayFab development experience within the Unity Editor. We consider this project a sandbox and are always open to feedback from our community developers. Let us know what we are missing and we will do our best to accommodate. The EditorExtensions Tab is open and nothing is being drawn. This typically is caused when the PlayFabEditorExtensions directory has been renamed. When toggling the API sets (Client, Server, Admin), sometimes the editor does not recompile and apply the updated definitions. You may move our plugin folder around; however, we discourage renaming the root(PlayFabEditorExtensions) folder. This may cause the relative links within the plugin to break. Unity Web Player - The editor Extensions will not work properly when Unity is set to output Web Player builds. Web player was removed in Unity 5.4, and is no longer a supported build target.